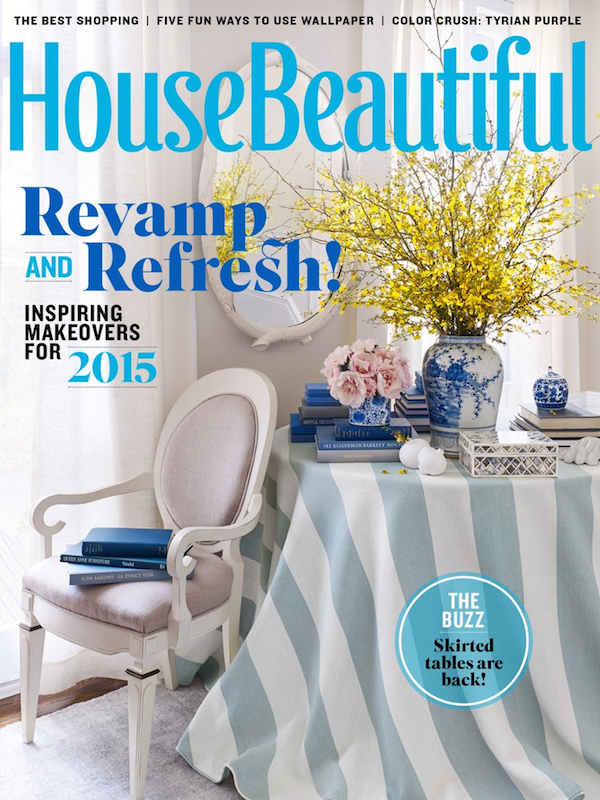 As soon as I got a peek at the project by Philip Gorrivan in the February House Beautiful, I knew I had to share. 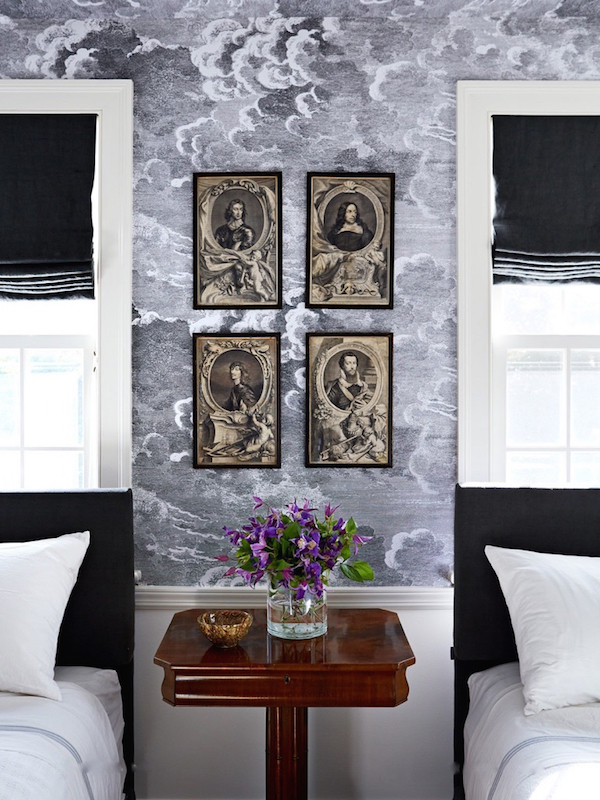 There is so much to applaud in Philip’s design for this charming Connecticut country house, not the least of which is his masterful harnessing of the power of wallpaper. And while the makeover is replete with artistic flair (the title of the piece) in the designer’s use of pattern and color, the 1920’s colonial still retains a country air. 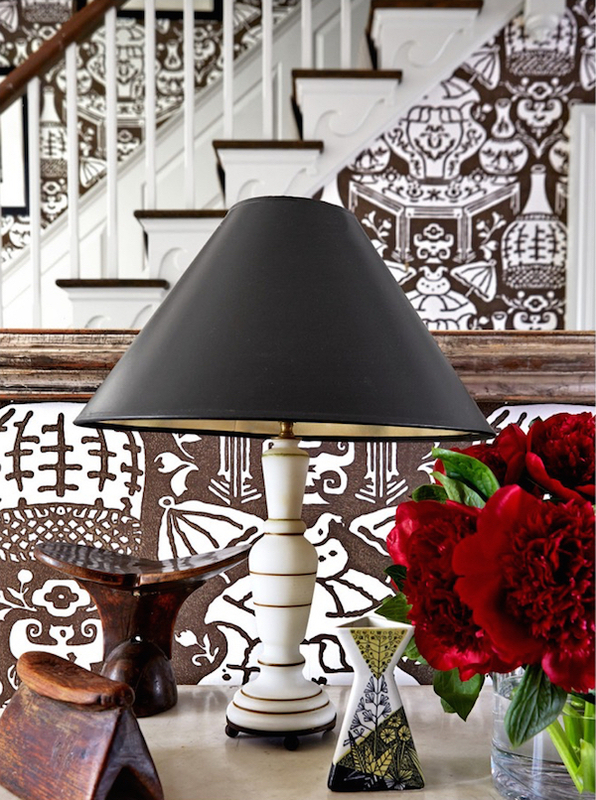 Bold pattern entreats you from the entrance, above, where David Hicks’ iconic Vase wallpaper sets the tone. Its timeless graphic chinoiserie seems in perfect harmony with the colonial revival scroll detailing on the staircase, rejuvenating it with updated vigor. 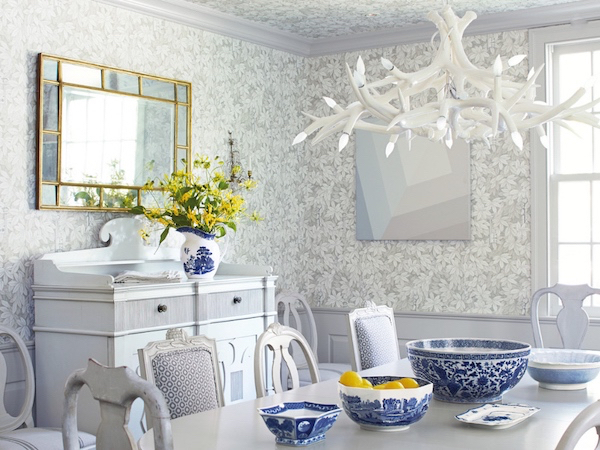 In the dining room, above, the Fornasetti wallpaper reinforces the winter white palette of the homeowner’s Swedish furniture. Continuing it on the ceiling embraces Philip’s vision for a snowy forest. And upstairs, Holland and Sherry Belfour wallpaper transforms a long hallway into a space with vibrant visual interest. But it’s in the bedrooms where the power of wallpaper really animates the spaces. An older son is enveloped by a sea of moody clouds in a room that tells a masculine and dynamic story. In an otherwise tailored and classic room, Fornasetti’s Nuvolette paper adds a brooding element for a young man of perhaps mysterious substance. As Philip says, the best rooms tell a visual story and this one feels brimming with character and potential plots. The two youngest sons share this colorful fantasy. Like an enchanted forest right out of C. S. Lewis, walls swathed in Cole and Sons’ iconic Woods wallpaper gives the stately Gustavian bed a fort like quality. There are some other terrific front of book and well features emphasizing the power of wallpaper and inspiring ways to revamp and refreshen your spaces. This entry posted in interior design. Entry Tags: Connecticut houses, House Beautiful, interior design, Philip Gorrivan, Wallpaper Bookmark the permalink. I LOVE wallpaper but feel all together this was just too much. Every room was great but not in the same house. No flow. My eye needed to rest. Is this what we will start seeing with the wallpaper trend? Chaos? More is not more in this case…my humble opinion. Phil Gorrivan is a genius! I love every room. Thank you John! Stacey, this was so beautifully written, you helped bring these rooms to life! So chic, fresh and original. These rooms charm – enough of the unexpected to surprise and keep them interesting. That cloud room you just want to study, and nap in on a rainy overcast day. You can feel those clouds scuttling around you. Looks like gray flannel shades? Amazing. Thanks for the fun narration! Wonderfully fanciful and bold! The house seems to be able to handle the papers with gusto. 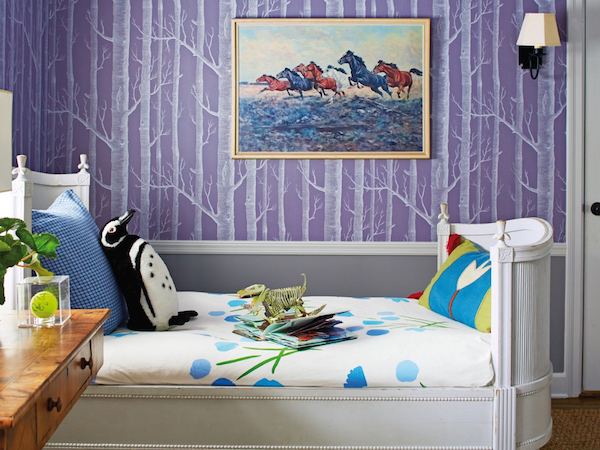 I love the continuity of nature themes and the movement within the papers, especially in the bedrooms. Conducive to dream filled sleep. Thank you for the post. Will now proceed to online purchase of Feb. HB. I think it is genius! There are solid walls in between the papered ones featured that do allow your eye to rest. Also, some of the paper designs are soft and subtle while others are bold and graphic. I dream of a vacation home where whimsy and wonder rule! As always, well-done Stacey! Really, really charming and welcoming and yet elegant without trying too hard. I loved this! Gorrvivan works magic in these rooms with his choice of wallcoverings! Love, love, love! Thank you for the feature Stacey! Wallpaper can absolutely be transformative!! I love it being shown on the ceiling! I truly enjoyed reading about this home. 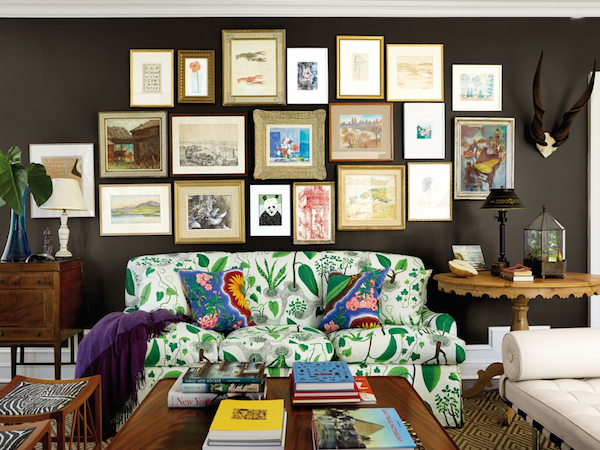 Thank you for talking about how great darker walls are especially when there are eye-catching framed pieces hung on it. Well done! This was one great issue Thank yo for sharing, Stacey! Perfect. I’ve been thinking about the Nuvolette since the magazine arrived. Wow. its amazing. i really love this wallpapers. Thanks for your sharing. 82 queries in 0.476 seconds.